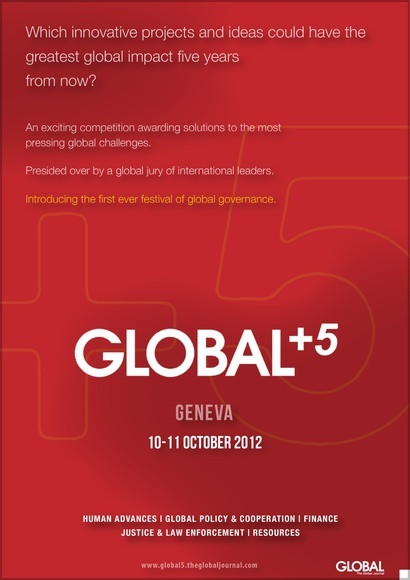 GLOBAL+5 is an exciting competition awarding solutions to the most pressing global challenges of the next five years. The event will take place in Geneva from 10-11 October 2012, where a selection of projects will be presented to a specially convened jury: the 'Global Shadow Cabinet'. This body will be composed of leading global actors from a variety of backgrounds. The special event is a platform for all individuals, groups and organizations – from the public, private or non-profit sectors – to present innovative ideas and projects. Topics range from democracy and global governance, to mobility and energy security. GLOBAL+5 is a unique opportunity to gain exposure, identify new trends, and exchange ideas with global actors from around the world. All projects must be submitted to The Global Journal by 31 August in order to be considered. Shortlisted projects will be presented to the Global Shadow Cabinet on 10 October and awards will be granted to the best projects on the final day of the event. Award winners will also be featured in a special end of year edition of The Global Journal. The composition of the Global Shadow Cabinet as well as the first selection of projects to be presented at GLOBAL+5 will be announced on 15 September 2012.